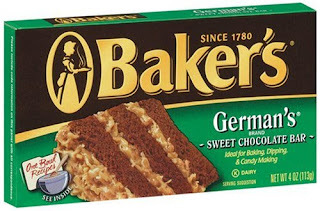 Sometimes favorite recipes don't come from Grandma but from labels on the products we buy--especially the favorites like German Chocolate Cake. My memories of this cake date back to my childhood. My Mother had a number of delicious cakes she made on certain holidays and the German Chocolate cake was one of about five she would bake on the days leading up to the big day. When we had holiday visitors drop in or a Christmas party, Mother would bring out the cakes (and cookies) and we would have a serving of our favorite, along with our guests. Then it would go back on the shelf or in the fridge until the next occasion. She always had something to take to parties and get-togethers it seemed like so little effort by our Mother, but she spent quite a bit of time before the holidays to make our season more than merry. In her recipe box, there would be labels and recipes cut from boxes of food products. The German Chocolate Cake was one of these recipe and we always loved it. Actually the correct name is Baker's German's Chocolate Cake on the recipe card I tore out of my newly purchased bar of sweet chocolate. It is a bar of chocolate formulated for the Baker's chocolate company (now owned by Kraft) by Sam German and the cake was first baked in the kitchen of a Dallas, Texas homemaker, Mrs. George Clay. Though people have traditionally dropped the possessives when the recipe is printed, it is interesting to note that the recipe is not German in origin--but southern (or southwestern). This isn't the first time I have made the German's Sweet Chocolate Cake but it is the first one I have made in years. I made this one (pictured at top) for my friend Billy because he has been sick and it is his favorite cake. I really love the fact that if I want to make certain favorites, I can just purchase a bar of chocolate and get not only a nice recipe, but a list of ingredients on the back so that I will not be able to leave the grocery store without the things I need to make the cake--very convenient for me and smart of the food company. Other favorites recipes of mine, printed on labels are the Hershey's Chocolate Cake and Frosting, the Knorr's Spinach Dip, the Swan's Down Angel food cake and of course German's Sweet Chocolate Cake. 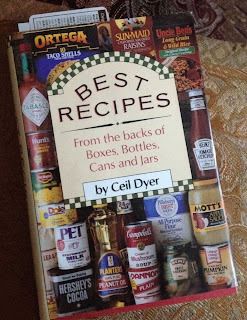 I often look through my cookbook by Cecil Dyer, Best Recipes From the backs of Boxes, Bottles Cans and Jars, for childhood favorites. It is a great book and often includes recipes that are popular but no longer printed on labels. I will caution you though. 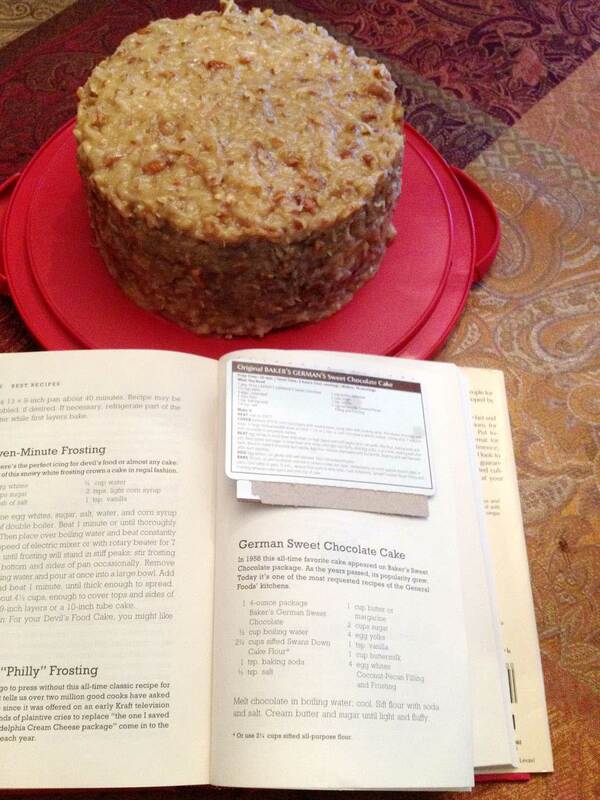 Sometimes the recipes change a little, for whatever reason and the recipe in my book is not exactly the same as the recipe on the inside of the Baker's German's Sweet Chocolate Bar I purchased to make the cake. I do know that the cake I made was really moist and light. Though I will have to rely on my friend to let me know if it is good, I believe I will be making that for my husband in the near future. At least he asked me to make him one, too which didn't surprise me.